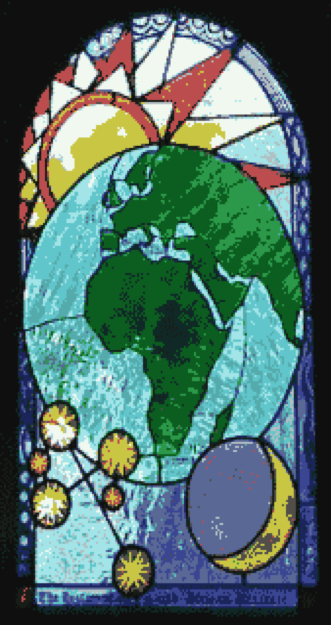 Below is a short synopsis of each glass stained window found in the parish here at Most Holy Redeemer. 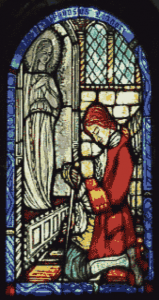 Most of the windows were sponsored by members of our parish in remembrance of a loved one. Thank you to all of those families – we will remember you in our prayers. 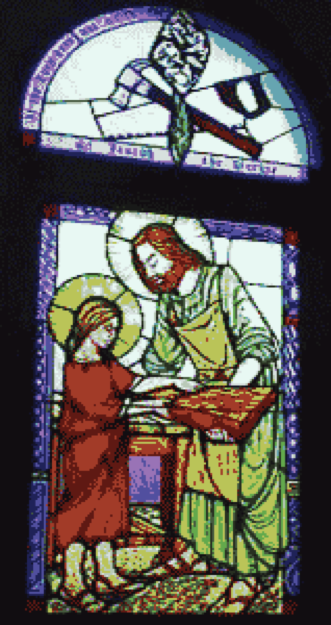 This window is dedicated to Our Lord under the title “THE MOST HOLY REDEEMER” which is the title of the church and also the official title of the Redemptorists. C.sS.R. is what Redemptorists put behind their names and it means THE CONGREGATION OF THE MOST HOLY REDEEMER. This window recalls the deep devotion that St Alphonsus had for Our Blessed Lady. Even as a young nobleman in Naples he dedicated his life to Her and sought Her protection, renouncing his heritage. 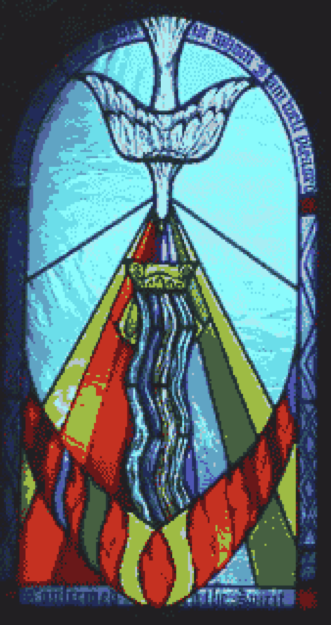 This window is dedicated to Our Lady under the title MARY OF THE MOUNTAINS. 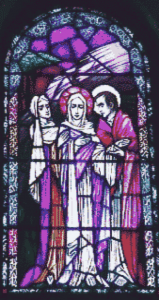 St Alphonsus had a great devotion to Our Lady under that title which was popular in the south of Italy during his lifetime. VENERABLE MARIA CELESTE CROSTAROSA was one of the founder members of the Redemptoristines – founded in 1731 in the south of Italy. She was a close friend of St Alphonsus. 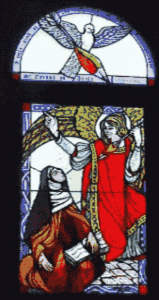 She had been a Carmelite before the Redemptoristines were founded, she died in 1755 and was declared Venerable in 1901. 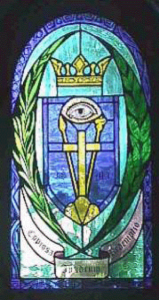 This window is a copy the coat of arms of the Redemptorists. 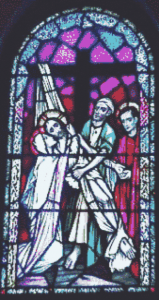 St Alphonsus founded them to work for the most abandoned souls and therefore he chose the signs of our Redemption – the Cross on Calvary, the spear which pierced the side of our Lord, the reed and sponge which they offered to Him, soaked in vinegar, as He was on the cross. And the grotto, chosen by St Alphonsus for his new Order – and with him there is plentiful redemption. ALPHONSUS DE LIGUORI was born in 1696 in Naples. He became a doctor of Civil Law and Canon Law. 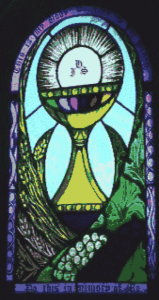 He became a priest and founded the Redemptorists in 1732. 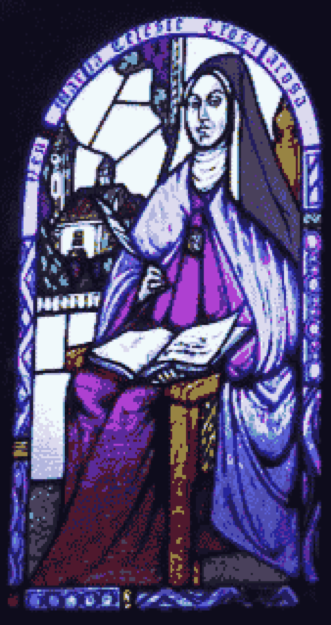 He wrote many books on Moral Theology and was appointed Bishop of St Agatha of the Goths. He died in 1787 at the age of 91. 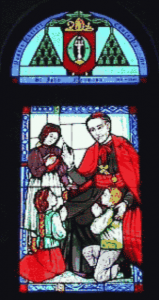 He was canonised in 1839, declared a Doctor of the Church on 1871, and Patron of Confessors and Moralists in 1950. 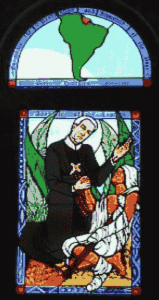 ST GERARD MAJELLA was born in southern Italy in 1726. 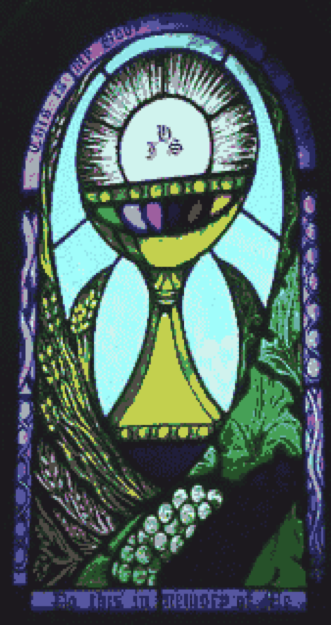 At the age of 23 he joined the Redemptorists as a brother. He died six years later in 1755. His short life was marked by the working of many miracles. 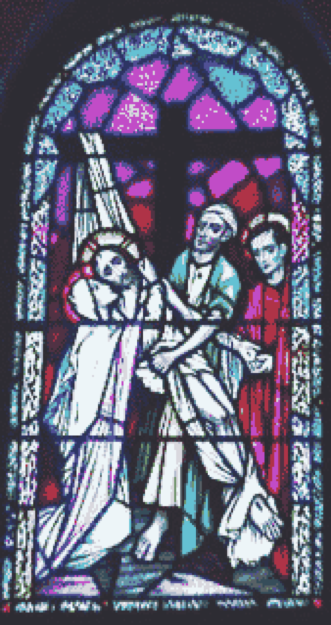 He was canonised in 1904 and is popularly known as the Mother’s Saint. ST CLEMENT HOFBAUER (Patron Saint of Vienna) was born in Moravia in 1751. 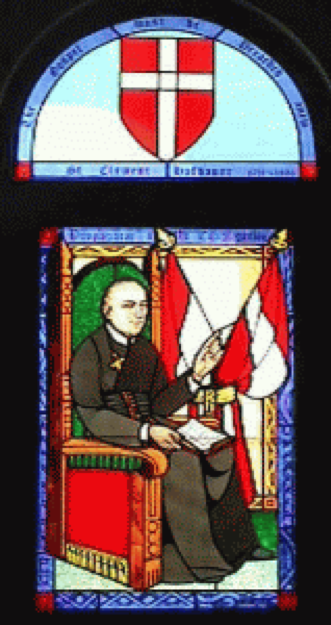 He joined the Redemptorists and was responsible for spreading the Redemptorists in Poland and Austria. 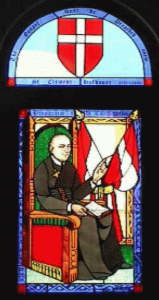 He died in Vienna in 1820 and was canonised in 1909. 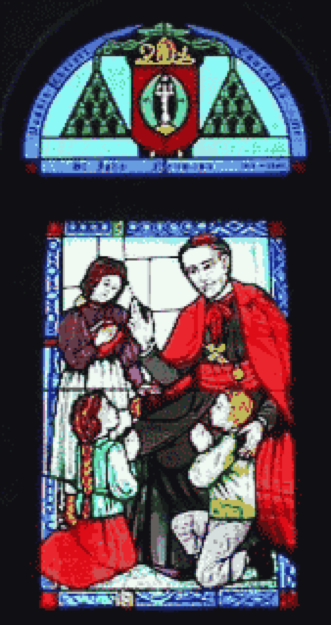 ST JOHN NEUMANN was born in Bohemia in 1811 and went to work in America. For nearly twenty-four years he worked as a Redemptorist Missionary, became the bishop of Philadelphia and died at the age of forty-nine. He was canonised in 1977, the 1st American male to be canonised. BLESSED PETER DONDERS. Born in Holland in 1809 and was ordained in 1842. He went to South America and 25 years later he joined the Redemptorists. He worked for almost 30 yrs for the lepers. 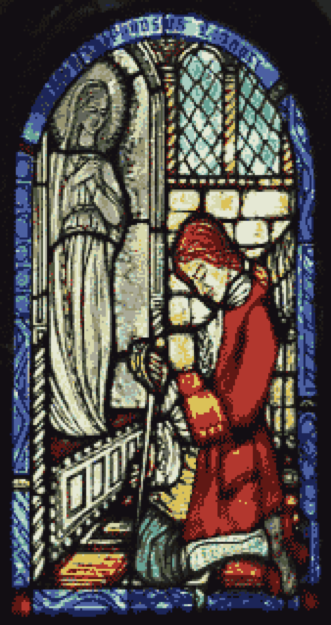 Died in 1887 and was beatified in 1982. 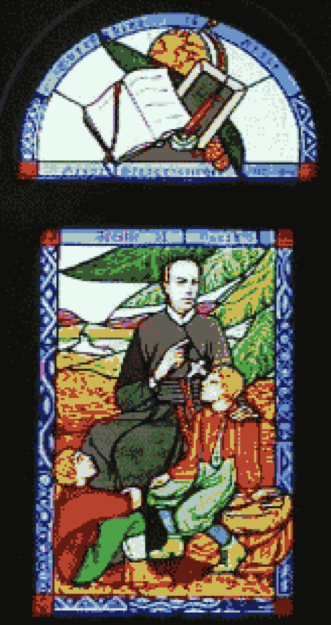 BLESSED CASPER STASSINGER. Born in Germany in 1872. 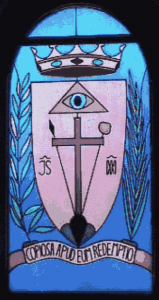 Entered the Redemptorists in 1892. Ordained in 1895. Worked for the youth. He died in 1899 at the early age of 28 years and was beatified in 1988. 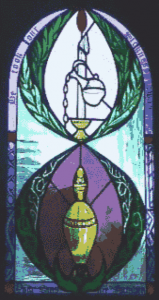 This window traces the spread of the Redemptorists from Naples where they were founded in 1732, to Falmouth in England in 1843. Then in 1912, three English Redemptorists, Fr’s Burke, Kirk and Creagh, left England to start a new foundation in South Africa thus fulfilling a dream of St. Alphonsus that his newly founded Order would work in South Africa. 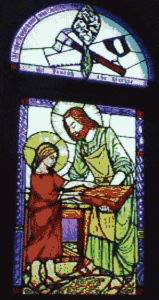 St Joseph the Carpenter. 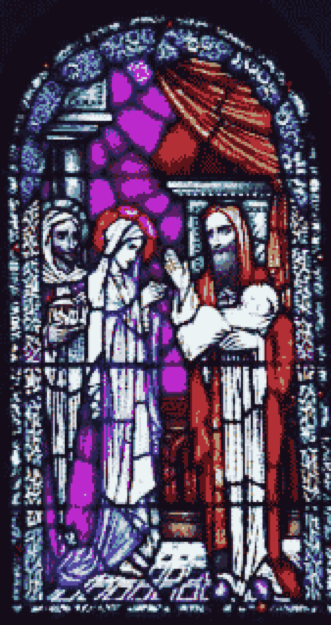 He was the husband of Mary and the foster father of Jesus. 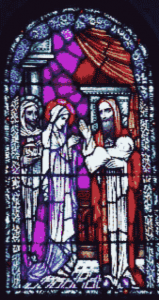 He led a simple life and supported Mary and Jesus by his work. This window commemorates the martyrdom of the Holy Innocents. These were the many children put to death at the command of King Herod hoping that Jesus would be among them. But He escaped with Mary and Joseph to Egypt. 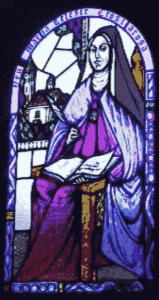 ST TERESA OF AVILA. 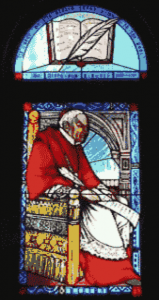 St Alphonsus was greatly influenced by the spiritual writings of this Carmelite Saint. She was born in Spain in 1515, was declared a Doctor of the Church – the first woman to be given that title. Her spiritual writings are still very popular. 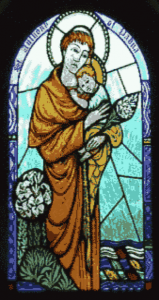 ST ANTHONY. 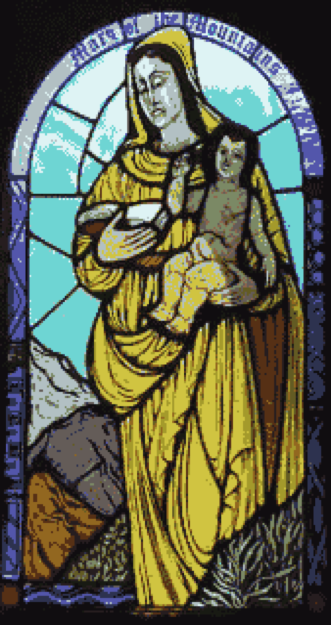 This parish was first dedicated to St Anthony when the original church was in Diep River. The parish school still retains that title. 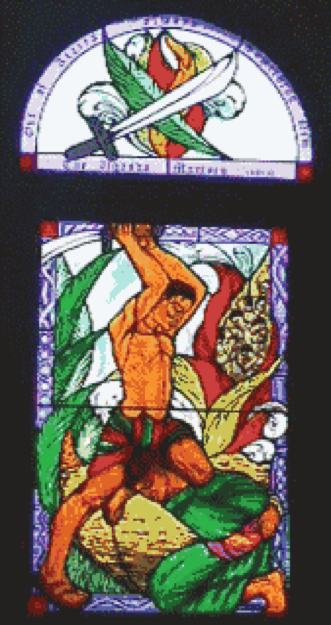 This window is dedicated to the many martyrs of Uganda. There were 22 of them, 17 of whom were under the age of 17 yrs. 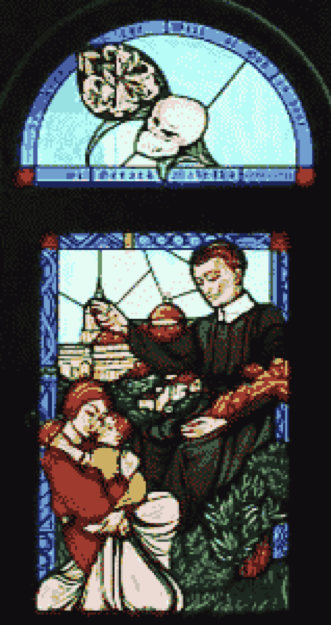 They were martyred in 1886 and were canonised in 1964. 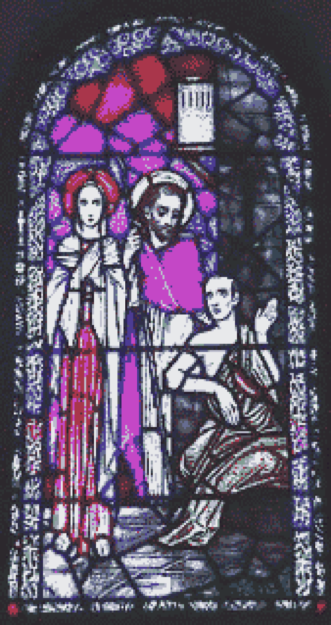 This window symbolises the Sacrament of baptism and confirmation, with the coming down of the Holy Spirit. This window symbolises the Sacrament of the Eucharist, established by Our Lord as a means by which He can be united with us. 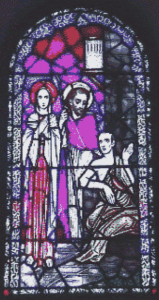 In this window, we have the Sacraments of ‘the anointing of the sick and ‘confession’ (or as it is known today – the sacrament of reconciliation) through which God’s healing love touches our lives. 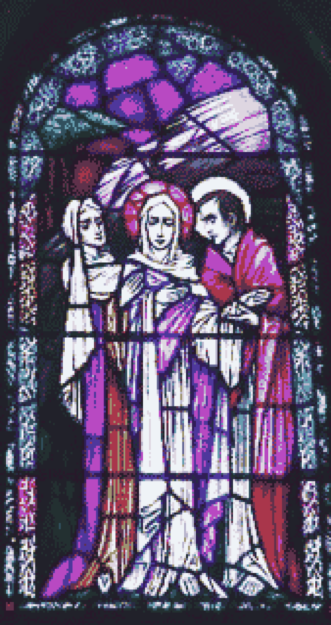 The Sacraments of Marriage and Ordination are represented in this window. 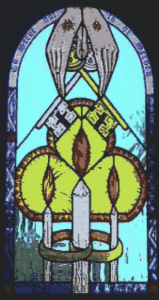 The hands represent the anointing which the priest receives at his ordination and the rings and the candle represent the unity of husband and wife in Christ. The 7 windows at the back of the Sanctuary commemorate the 7 sorrows of Our Lady. This one is ‘Simeon’s prophecy to Mary that Her Son would die and that a sword of sorrow would pierce Her own heart. 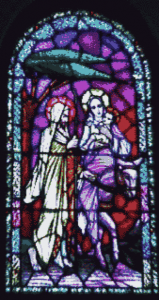 The flight into Egypt – when Joseph took Mary and Her Son to escape from King Herod who has ordered that all children in that area under the age of 2 should be put to death. 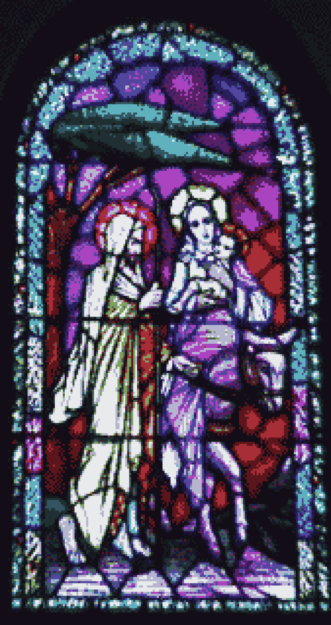 The meeting of Mary and Jesus on His way to Calvary. 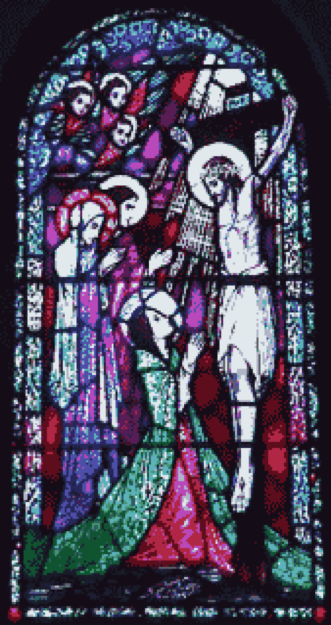 The death of Jesus on the Cross. 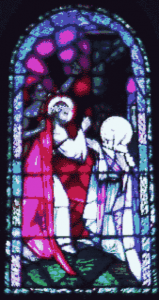 The piercing of the side of Jesus and the taking down from the cross when He was placed in the arms of Mary.